Spoiler Alert! This is one of my all time favorite immersion circulators for cooking sous vide. The GSV140 simply hits all the main points that are important to me. Below, in this review of the Gourmia GSV140 I'll tell you why those things should be important to you too. Those things include: heating water fast, keeping water at an accurate temperature, and alerting me when to start cooking as well as when cooking is done. It's very inexpensive for the features you get. Though it's not the newest model from Gourmia, it is my favorite model from the brand, and also my #1 choice immersion circulators I would rate as “inexpensive”. The actual price changes frequently, but it's generally available for a similar price (within $10) to other brands that simply can't compete with the performance capabilities of this device. 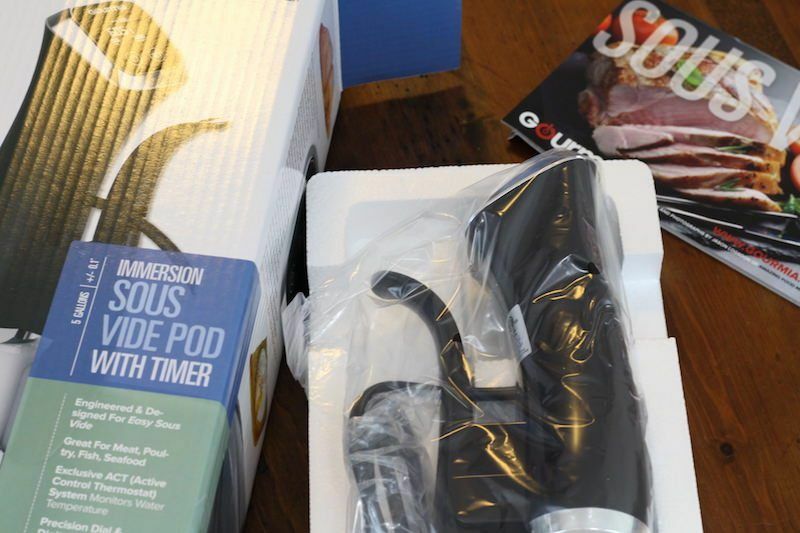 The Gourmia GSV140 is the second generation sous vide immersion circulator put out by this brand. It's got a slightly different setup than the original gen-1, but much of how you interact with the device is the same. There's a power button and SET button on top that allows you to interact with the device. Press and hold power to turn it on, then tap set to set a temperature and time. Use the dial in front of the circulator to increase or decrease the temperature and time. Tap the power button once to start heating the water. Once the target temperature is reached, your device will start beeping every 3 seconds to let you know it's time to drop your food. This is a very convenient feature that I've grown to expect from immersion circulators. How else would I know my food is done? Devices like the Kitchen Gizmo and Kitchen Masters [LINK] do give you one beep, but if you are out of the room or busy doing something it's nice to have a reminder. Hold the set button for 3 seconds to stop the beeping and start the “total time” tracker (see extra features for details on this). 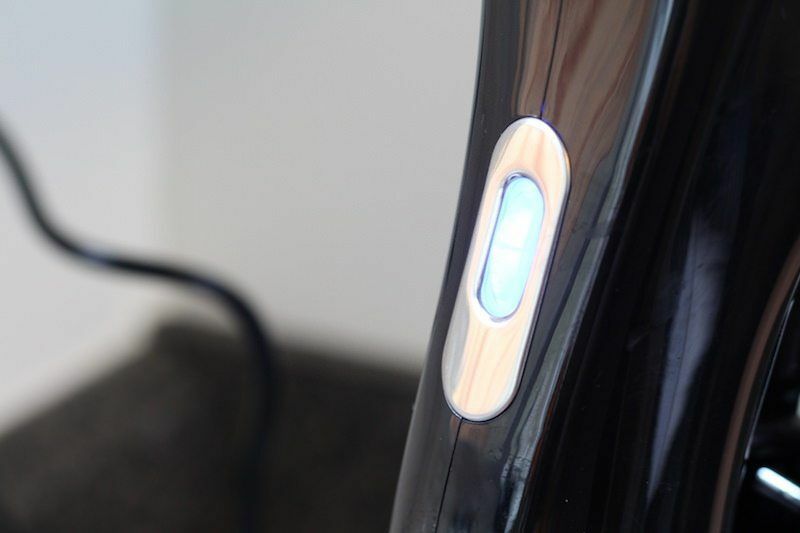 Aside from that, you'll noticed that this is a “clip” style immersion circulator. I prefer this style to the “screw” kind which you have to twist to secure. It just takes longer to do and I feel like it's not as secure. You may have a different preference than me. Both work well, but I just prefer this kind you see on the GSV140 (and other Gourmia models). On the front of the device you'll see an easy-read min/max fill lines. You can use the GSV140 to heat up to 10 gallons of water, but in general, you won't need that much. You need just a few gallons to cook a (couple) steaks for dinner. 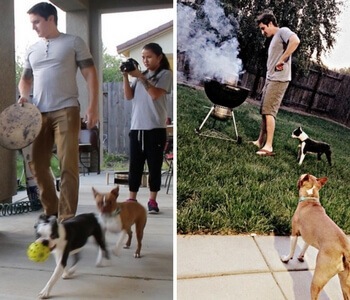 This particular device is great for personal use and for families. If you plan on cooking large amounts of food frequently, you may want to consider an industrial style sous vide we have listed on our premium immersion circulators, though they are quite a bit more expensive. 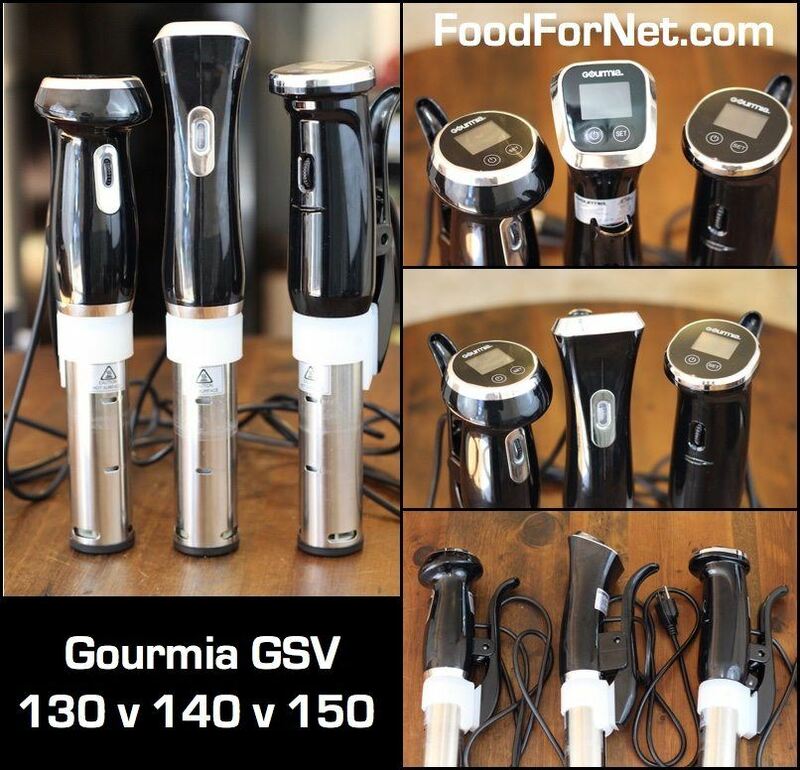 ==> Get The Gourmia GSV140 Here! 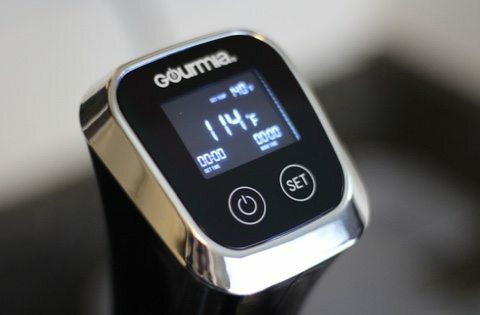 Though not technically “extra” one unique feature worth noting is that Gourmia immersion circulators offer 1200 watts of power, which means you're going to be heating your water a lot faster than with other brands. Some circulators that cost 30% more only offer 800 watts of power. Even some of the high end sous vide devices that cost twice as much only offer around 1000 watts of power. The difference between 1000 and 1200 watts might not make that much of a difference, but when you consider the cheap price of the Gourmia models, you are paying fewer dollars per watt of power. One very interesting feature of the GSV140 as well as the 130 and 150 is that there's a “Work Time” AKA “Total time” counter. So if you set your food to cook for 1 hour, but are away from the house running errands and are late getting back, you can see how long your food has been cooking. The GSV140 will continue to hold your food at that temperature until you turn it off. Sous vide is not like regular cooking where if you leave it running for too long (within reason) it will dry out your food. So your food will remain warm and ready to finish cooking for as long as you need. Other sous vide immersion circulators simply turn off when done, assuming you'll be around somewhere to take care of business. They also don't tell you how long ago your food finished, so if you come home late, your food might have been sitting there for 30 minutes or 90 minutes – who knows?! Anyway, this is one cool feature that I really appreciate! With the GSV140 I cooked some salmon. Salmon is interesting because you can eat it raw if you're eating sushi, but at home, with cuts you buy from the grocery store that sit in the fridge, you want to make sure it's thoroughly cooked. The first time I had sous vide salmon, I was shocked to taste the difference between pan frying and sous vide. It was black and white. 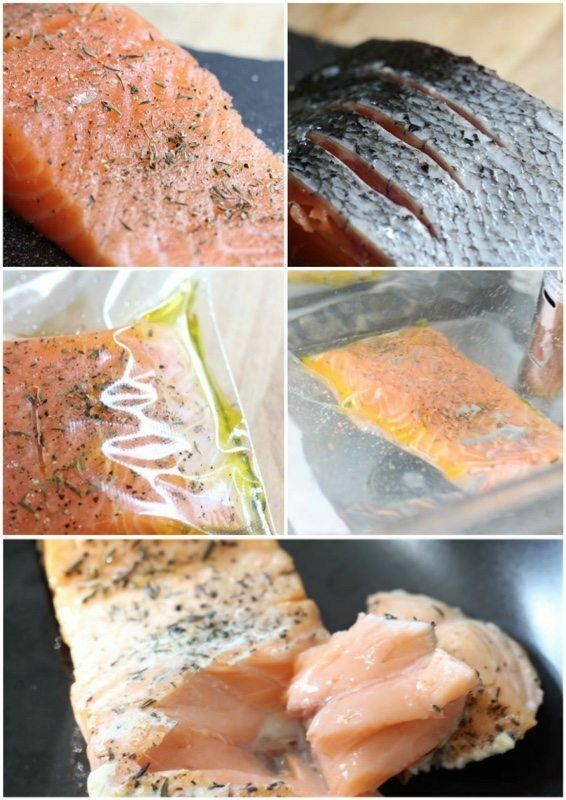 Pan frying leaves you with a flat, dry, and greasy tasting salmon. I used to love that flavor and think it was normal. The tender, buttery-soft texture of sous vide salmon is like none other. If you haven't tried it, make this your first recipe to try with your new Gourmia immersion circulator. One tip I learned online is that you can score the back of the salmon skin before bagging it. That will get more flavor into the salmon and also allow for more crispy edges when you finish it by quickly searing in olive oil. If you like to eat the skin, this'll give you more crispy bits too! I just used a bit of salt, pepper, and dried thyme for this recipe, although I usually try to use fresh herbs. What does all this mean? The GSV140 is a pretty standard size for immersion circulators, although it's a bit taller and slimmer than previous models from Gourmia. at 3.1 lbs, it's actually pretty lights, consider that some other circulators I've reviewed weight 7 pounds! 2.1 gallons per minute for pump circulations is about middle of the road, and you'll find that some circulators do only 1.x, while some go up to 3. Honestly, when cooking small amounts of food, you won't notice a difference. If you plan on doing larger amounts of food you may want to look into a stronger motor, but I wouldn't make it the deciding factor. Gourmia says that with this pump you can cook food in up to 10 gallons of water, which is quite a bit. Some other brands will limit you to 5 gallons! 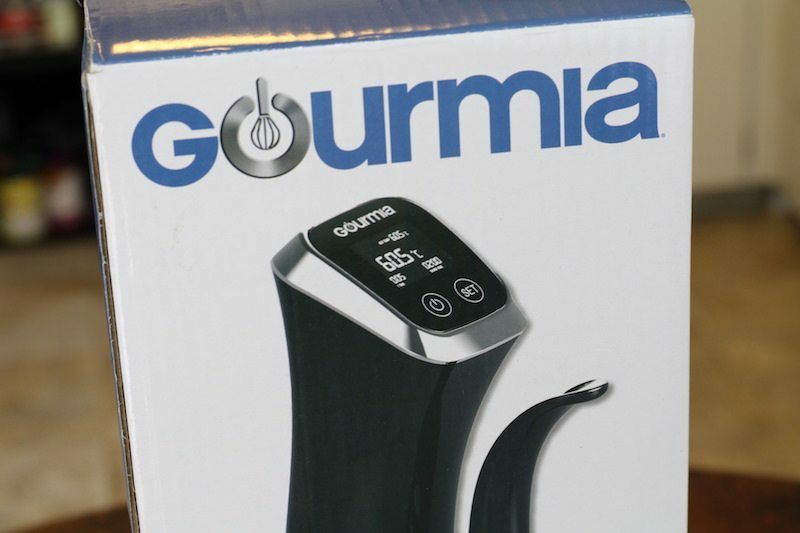 The main deciding factor for all Gourmia immersion circulators is that they pack a whopping 1200 watts of heating power. That means you will be able to reach your target temperature much faster than most other circulators. A few others like Joule get up to 1100 watts and Sansaire puts out 1000 watts are able to brag about it, so 1200 is quite impressive considering other popular brands are only using 800 or 900 watts even for Gen 2 models (namely Anova). 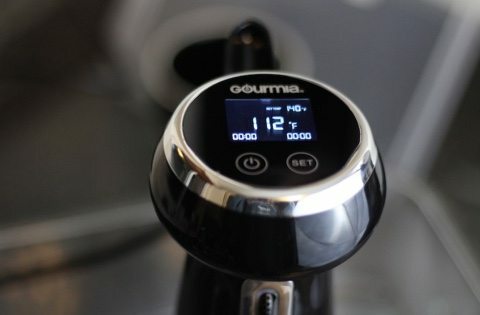 Gourmia has a number of circulators I tried out, and they also produce some water ovens that I'm looking forward to testing in the next few months. So for this comparison section, I wanted to cover how the GSV140 compares to older and newer models put out by the Gourmia brand (quickly becoming my favorite brand of appliance). I also want to cover how this particular appliance compares to other brands within a similar price range as well as more expensive/cheaper devices out there. The GSV130 is the previous model, and the GSV150 is the newer model. Easy to remember, right? From the image below, you can see that each model has it's own unique look. The 140 is the only one with a light-up setting dial, which you can see is clear in this photo, though lights up blue in another photo on this review page. The look of the face is probably just a matter of personal taste, though I do like the 140 the best. In case you didn't already notice, the face of the GSV140 is reversed compared to the other models. Why? I'm not sure. Depending on the position of the plug and your pot in the kitchen, this could a be a convenience or small hurdle. It won't make much difference when cooking since you interact with the device so little, but it's worth noticing! In terms of technical specs, they are all quite similar. They all have 1200 watts of power. The 140 has a slightly stronger water pump than the other two, but you won't notice with smaller water containers. The digital screen and way you interact with each of the devices is the same as well. I like the consistency, so I don't have to relearn a new method each time I upgrade. Talking about price, well that fluctuates depending on where you buy and if discounts are available for older models. Currently, the oldest model (130) is about twenty dollars cheaper that the second generation, and that one is also about twenty dollars cheaper than the third generation. The biggest difference you'll find is that with the newest model you get wifi connectivity. That means you can start and stop your cooking remotely, as well as monitor progress through your smartphone. This is a pretty nifty feature. You may be thinking, “Wifi cooking sounds like a gimmick!” It's not. I actually found it very useful especially since I'm pretty busy during the day. However, there were a few issues with the app which you can read about in my review (linked above). Within that post I also talk about other wifi enabled immersion circulators if that interests you. Despite it's usefulness, if you're going with a wifi model I'd pick a different brand. 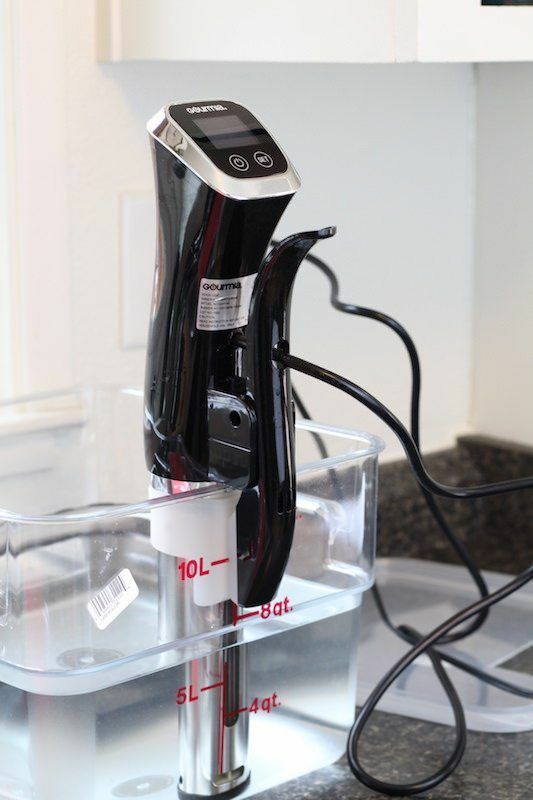 If you are going with a non wifi model, the GSV140 is my #1 choice because it's so inexpensive and powerful compare to any other immersion circulator currently available. Looking at this price range of about a hundred dollars, there are quite a few different brands and models to look at. Most devices range between about $80 to $130 and the GSV140 falls within that range. If you look at the cheapest of the cheap you can get an AdirChef, which is currently the most inexpensive circulator that I've ever bought. NutriChef [LINK] also fluctuates in very low prices so that's worth looking at too. All others all hover around the $100 mark. Even if you spend up to $130 you will still not get a “better” device than that GSV140. For example the 2nd-Gen Anova Precision only has 900 watts of power, 1 GPM, and a 5-gallon max capacity. With this model from Gourmia, which is cheaper, you get 1200 watts of power, 1.5 GPM, and 10 gallon max capacity. The Anova model does come with bluetooth/wifi connection, and their app is better than Gourmia though, so that's worth considering. Also, the Anova cooker is much quieter than Gourmia, possibly because of the way it sits in the water bath, possibly because it just has a quieter pump. Others like Instant Pot [LINK] only have only 800 watts of power, and also lack features that I like about Gourmia. For example, there's no beeping reminder when your water reaches the target temperature, and there's no “total time” tracker. In my opinion, you can't get much better than the GSV140 for the price, so it's my #1 choice for inexpensive immersion circulators. If you want to upgrade to premium immersion circulator you'll be looking at spending at least $200. Some, like the Joule, are actually better in my opinion and worth the price. Others, like the Sansaire, are only worth the price if you need specific features like the flat bottom and 3 gallons-per-minute water pump. Past that you get into the $700 range which are only worth the price if you are looking to use sous vide for a small professional kitchen. Who Is The Gourmia GSV140 Best For? 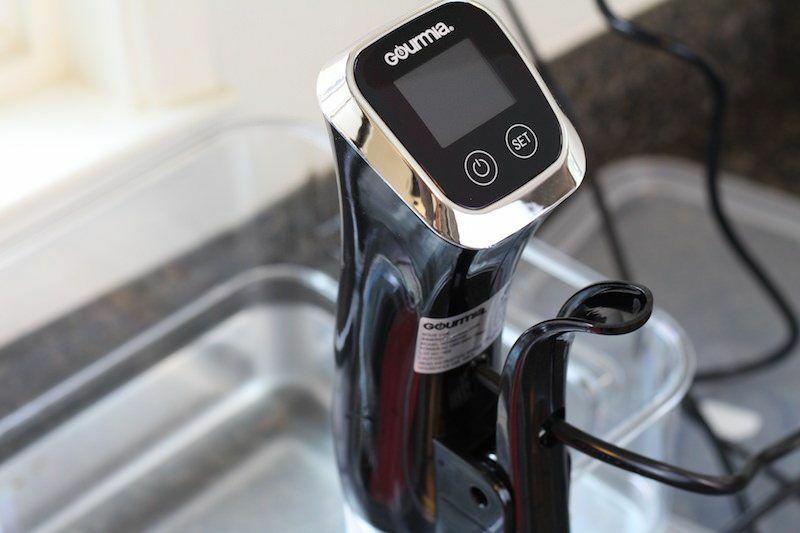 The Gourmia GSV140 is simply the best choice for most people looking to buy an inexpensive immersion circulator. It's got a very strong water heater, sufficient pump circulation for the majority of home users, and you aren't paying for unnecessary upgrades like wifi or apps. It does its job, and it does it well. On top of that it's got a very nice design, and a range of colors you can choose from. Though it's not the most recent model, I feel like it's the best that Gourmia currently has to offer. Maybe if they improve the app I could recommend the GSV150 model more enthusiastically, but for now the GSV140 is my favorite. ==> Get The Gourmia GSV140! 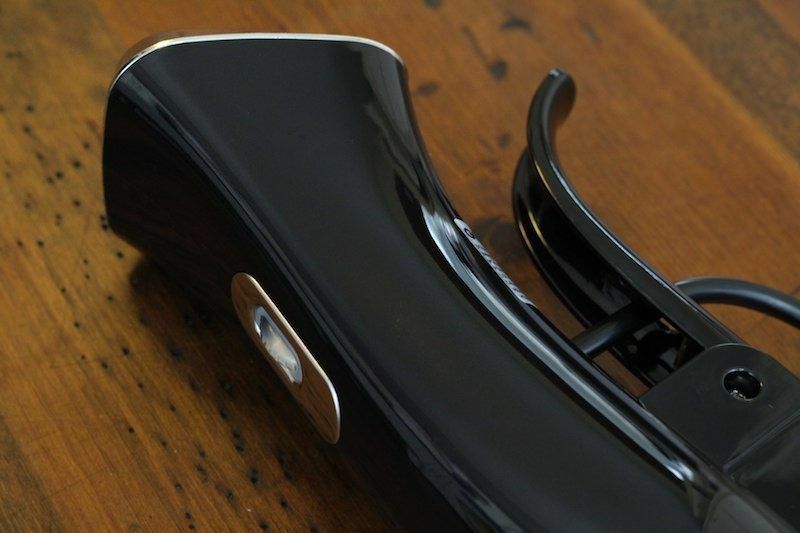 The GSV140 was definitely a winner in my book, and worth every penny. 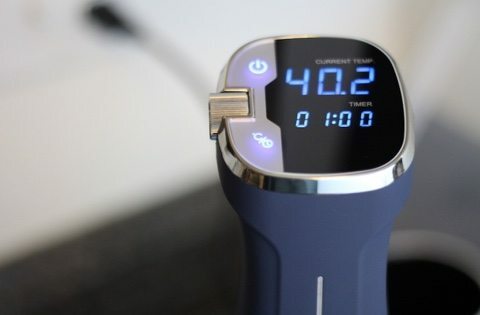 I tested 11 different sous vide immersion circulators and this was my #2 choice out of all of them, including the premium ones. Only one other was ranked higher in my mind: the Joule. It's a bit more expensive, but it's also slimmer, lighter, comes with an incredible app, and includes interactive cooking guides. There are more things I loved about it too, but you can head over to my Joule review to see more if you want to learn more about it. 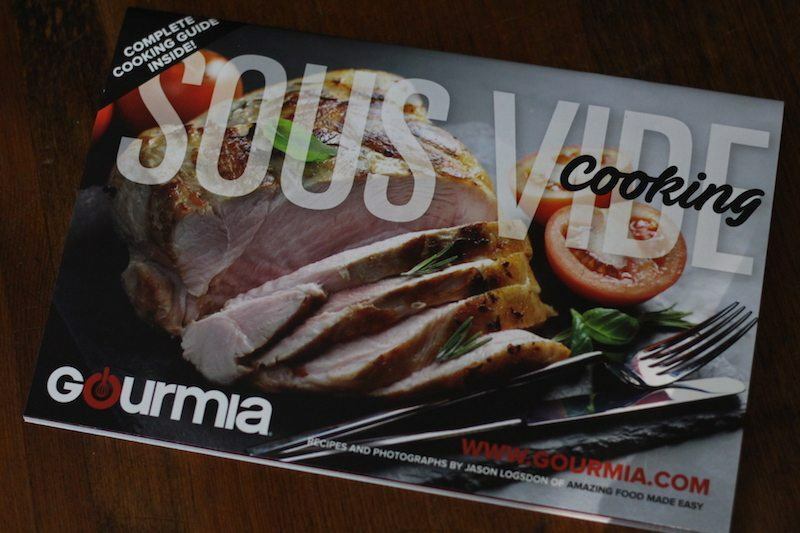 Every Gourmia sous vide device comes with a free, color-picture cookbook from a famous sous vide guy. A full picture of what this appliance looks like in action. Which of these models come in 220Volt format. I am in South Africa and would dearly like one of these. Both Anova and Sansaire have 240v versions available in some countries, but you have to buy from your local Amazon to find them. They are not available through the US Amazon.